My father had passed away, but life goes on. 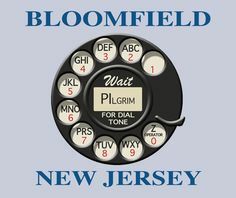 We were at my grandparents' garden apartment in Bloomfield, New Jersey; but it was November and everyone else was in school, so it was lonely during the days. And it was cold, too; so it wasn't much fun to play outside. Still, we did; and I had my first experience getting lost. The apartment complex was made up of many identical buildings. The back yards of these buildings were distinct in the placement of clotheslines, swing sets, and the like; but I was used to the jumbled individuality of the homes on my street in Garfield and the woods of Vermont. So the similarity of the buildings threw me. I had set out to find this kid I played with. I knew he lived a couple of buildings over and I had been to it with him; but now I couldn't remember exactly how many buildings over it was. And when I gave up trying to find it, I discovered I wasn't certain which one was my building. I eventually figured it out, of course. But being lost was a scary prospect. I note, however, that at 7 I didn't cry over it or seek the help of an adult—I worked at the problem until I did figure out where I was. After all, I reasoned, I wasn't really lost. I was obviously in my grandparents' apartment complex. One of those buildings had to be theirs. And then my sister Mary Joan and I were enrolled in grade school, and my sister Louise into kindergarten. Louise's teacher was Mrs. Pratt—funny how I recall that, but can't remember my own teacher's name. However, Louise loved Mrs. Pratt while my feeling regarding my teacher was entirely neutral. She was neither scary nor inspiring. I remember the classroom, vaguely, typical for the year with one-piece desk-chairs. The desktop was a flat slab of pressboard and books went into a cubby beneath the seat. I have an odd, detached memory from this period. It's too vivid to have been a dream, yet I have no lead-in memory or lead-out. I have since learned that this is indicative of an alien abduction/contact memory. I was in a storage room, which I thought was in my school although what seemed to be stored there was mostly TV sets. I was sitting in a chair watching the TV—I don't remember what was on—with a dark-haired boy sitting next to me. That boy developed a severe nosebleed and began to cry. I comforted him and tried to stop the bleeding. I'm not certain if I succeeded, as the memory ends there. However, decades later, when I met my future husband Michael and described this memory to him, he got a strange look on his face and asked me to try hard to recall the face of the boy whose nose was bleeding. I realized, it had been him!—Michael. It turned out that Michael, also, had carried this strange memory with him for all those years; and now we had found each other. I should add, Michael lived in New York at the time and did not attend my school. There was a boy in my class, Brian, who'd had polio and was crippled. Being only second graders, we never gave him a second thought, accepting him as he was. In general he was perfectly capable. However, Brian couldn't run. Recess was not free-form; we went outside and played kickball. I found the rules to be incomprehensible but the teacher always told us what to do next so that was okay. For some reason, I was always right behind Brian in line—perhaps the spelling of our last names had something to do with that, since we also sat next to each other in class. Brian couldn't run, but he could kick. So the teacher let him kick the ball, but then would have me do the run for Brian. Then it would be my turn, and I would run again. Or not. I found I never could predict whether I would run or not. I suppose now that it had something to do with whether another kid got the ball I had kicked, but at the time it was a complete mystery to me. We were encouraged to open "savings accounts" that were somehow managed by a bank that had made an arrangement with the school (or vice versa). We brought the money to class—I think it was two dollars a week—and our account booklets. The teacher would collect them and take them to the bank, then return the booklets to us the next day, where we would open them and gaze at the typewriter entries showing our deposit and new balance. (This was, of course, when all bookkeeping was done manually.) I guess the idea was to impress us with the idea that savings can increase steadily, and perhaps show a practical example of simple arithmetic. One day, however, when I got to school the money was missing from my account book. I have no idea where it went—it must have slipped out from between the pages somehow and blown away during the walk to school. The teacher chastised me and Mom scolded me when I got home. (In fact, Mom continued to bring up this incident for the next fifty years whenever she wanted to make the point that I was unable to handle money properly.) This was clearly the beginning of my deep and abiding hatred of banks and banking. Our walk from Gramma and Grampa's apartment to school took about twenty minutes. We walked with neighbor kids, and our walk included taking a shortcut over a railroad trestle. I'm not sure Mom realized that was our route, but we were just following the other kids. One day, Mary Joan got a loose shoelace caught in the tracks. She was convinced a train was coming and would kill her, though none was in sight. Our memories diverge at this point, as I remember getting her shoe unstuck and she remembers me running off and leaving her. Of course, if I had left her and a train was coming as she also recalls, she would now be dead. But who knows? I don't think we celebrated Thanksgiving that year, my father having died less than two weeks before. If we did, it was with a simple turkey dinner. But there was no way Gramma would have permitted Christmas to be missed, even if she had to point out to my Mom that the holiday had to be celebrated "for the children". Gramma and Grampa had a little tree, handmade, about two feet tall, with miniature decorations sewn onto it. They hauled it out each year and that was our tree; the presents were placed in mounds around it and on the floor. I slept on the living room sofa so Santa Claus would have had to be especially quiet to not wake me. In fact, I half-awakened that night to see three figures stealthily carrying wrapped boxes into the room, but fell back asleep almost immediately. It would be months before I would recall this experience and put two-and-two together. In the morning we awoke and then remembered it was Christmas! and ran to awake the grandparents. (Mom was sharing a bed with the girls so she woke up when they did, whether she wanted to or not.) Then we ran into the living room and began ripping paper from boxes. Mom made a half-hearted effort to urge us to remember what had come from who, so we could thank them. I had no idea what she was talking about, since the presents were all supposed to have come from Santa Claus. But Gramma, who was really my step-grandmother and had never had children of her own, encouraged the free-for-all; and seemed to love the idea of having noisy, happy, children in her house for Christmas. Every now and then, Grampa took me to the barber shop for a haircut. Most barber shops were not very kid-friendly and I didn't like getting my hair cut. But there was one barber shop I liked, because it had carved and painted carousel horses I could sit on while waiting for my turn. That wasn't Grampa's regular barber, but he must have asked his friends for recommendations on where to take a kid for a haircut in order to find it. It never occurred to me to ask for any particular style of haircut. I hadn't yet realized there were styles of haircut. But the ones Grampa got me were moderate in length, short on the sides, longer on top. Many other boys wore "butch" haircuts (also known as buzz cuts) but I didn't envy them. At this age neither I nor my sisters gave any thought to plans for the future. We were, now, simply living at Gramma and Grampa's apartment, as if we always had been; and we never wondered how long that would last. Eventually the long winter ended. Snow melted in irregular lumps, leaving soiled white hills and muddy valleys on the sidewalks and back yards. The air was frigidly wet, but at least the sun was usually shining. Then one day, when the snow was completely gone, Mom came home with a new car. 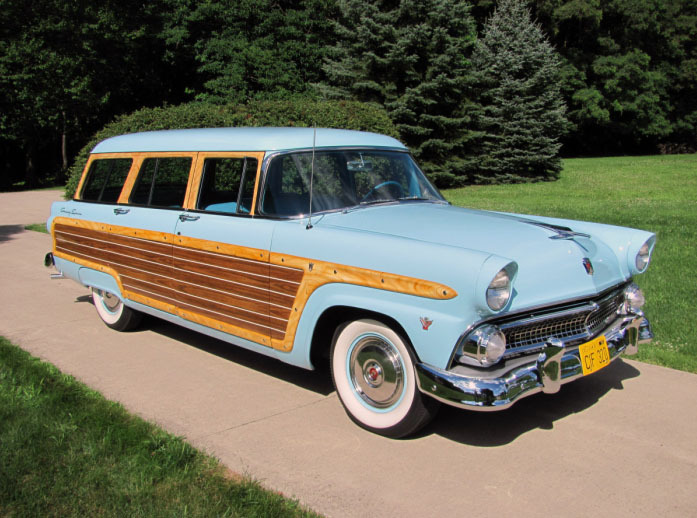 It was a blue Ford Country Squire station wagon, with wood panel sides. In this, she said, my sisters and I would return to the house in Vermont.